Need an indoor electric grill that's a breeze to clean? Here's a list of 5 of the best grills with removable plates for you to bring BBQ inside. Grilling is enjoyable when you have a tool that is easy to clean. What you need is a grill with removable plates. Cleaning it is simple and fast. Grills with intact plates take time to clean. It will be a real struggle removing food particles from the tiniest of spots. That said grills with removable plates are usable both indoors and outdoors as long as there is a power source. You will not deal with charcoal smoke or gas odor, which are detrimental to your safety while indoors. Electric grills allow you to focus on other tasks around the kitchen since they require minimal heat monitoring. Turn the temperature knob to your desired level and let the grill cook your food. Various grills with removable plates do more than grilling. They let you try other cooking methods such as griddle and Panini press. The removable plates are hand and machine washable; therefore increasing convenience. Do you want to start grilling while indoors? Herein are five good examples of the best grill with removable plates. The brand incorporates a tough, advanced, non-stick coating that makes the grill look as good as new for a while. It is durable and easy to clean. You do not have to apply butter or oil on it before you start cooking. 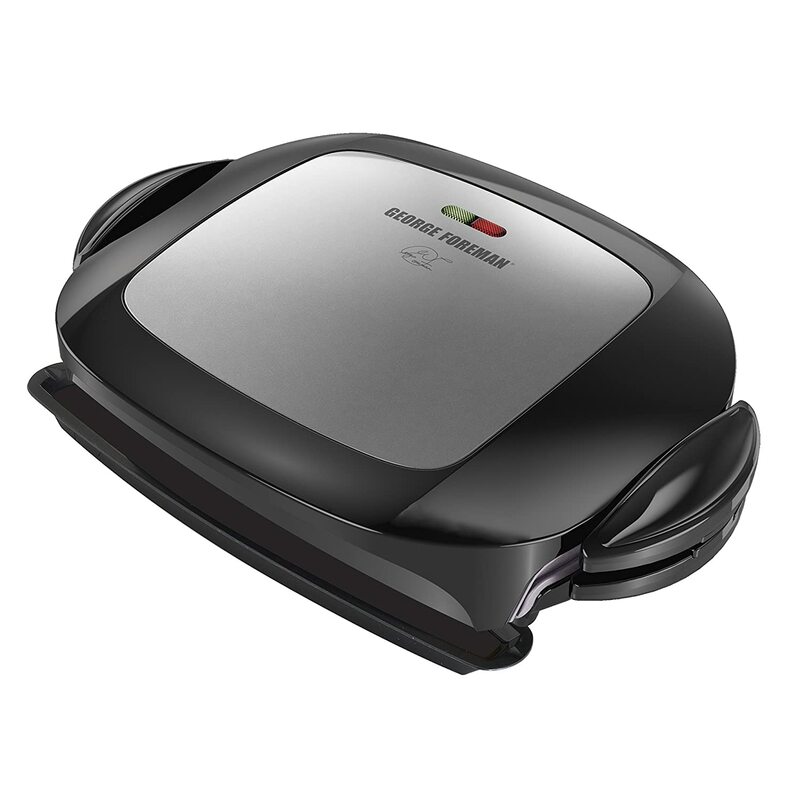 George Foreman’s black interior is elegant and looks fantastic in any kitchen décor. It allows you to make four food servings thus suitable for a family or one person. It is also small and compact to save space on your kitchen counter. The equipment heats up fast to ensure you take as little time as possible preparing meals be it vegetables, snacks, or main dish. After cooking and enjoying your meals, scrap food particles from the plate and wash or use your dishwasher. The removable plate comes in a drip tray design. The sloping surface helps with fat removal from food especially meat; therefore, providing you with healthy, well-cooked meals. 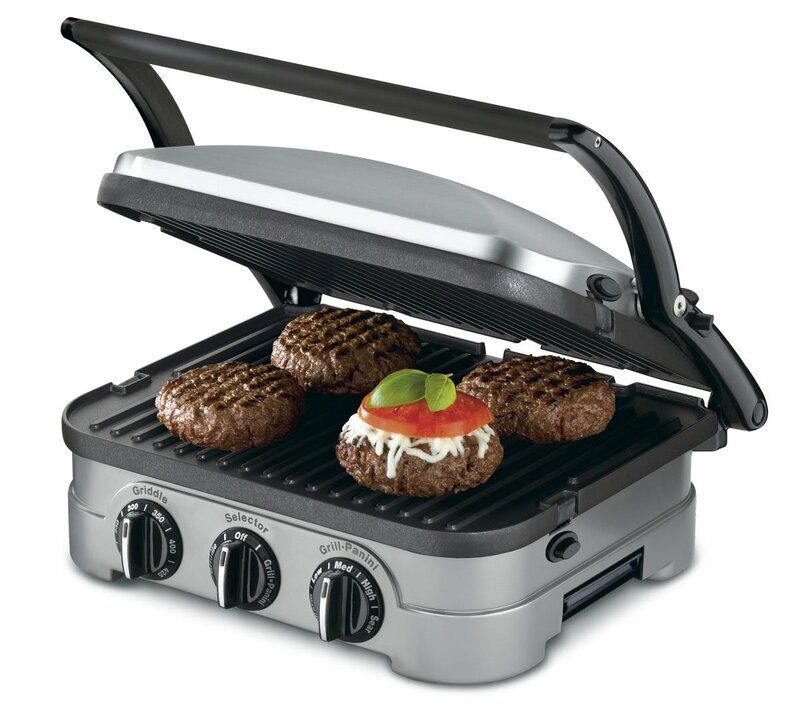 Hamilton Beach grill offers users an eye-catching design, which includes brushed metal for an irresistible luster. It boasts of high heating capability (a maximum of 450degrees), that ensures proper food grilling. Adjust the temperature control and cook at different heat levels be it slow or fast. Temperature ranging is 200-450 degrees. 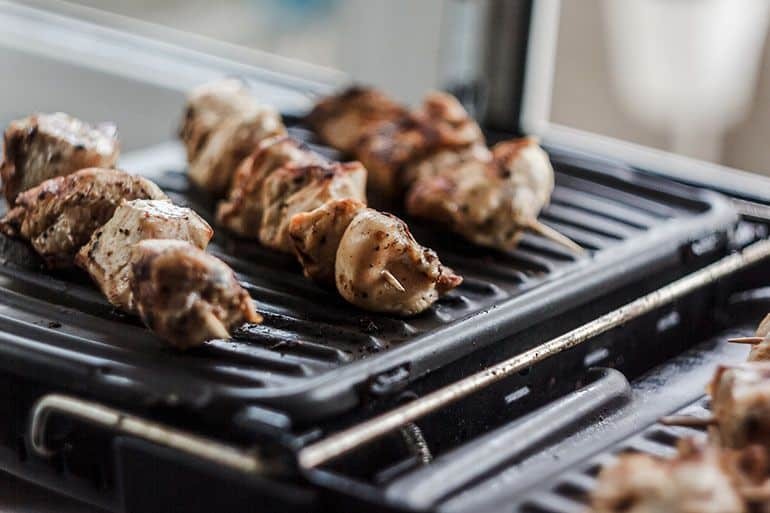 The best indoor grill uses a nonstick plate, which prevents messy grilling and ensures easy cleaning. This manufacturer has that factor in mind. Hamilton’s grilling surface is spacious to fit food of up to eight servings. With the indicator lights, you can know when it is time to start grilling. 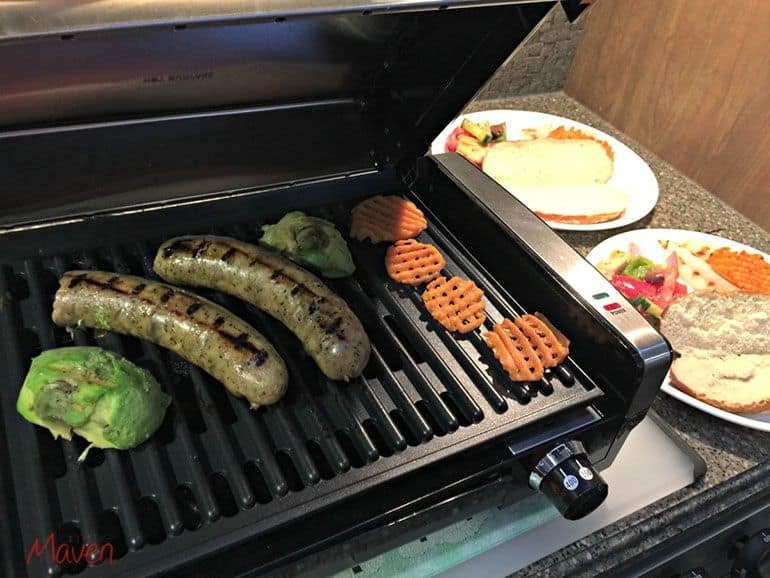 This indoor grill has a large drip tray, and a removable hood plate and both are dishwasher-friendly. George Foreman appears twice on the list of the best grill with removable plates for several reasons. One of the differences between this model and the previous one is the number of servings. This make fits five servings while the former four. You are also in a position to make five different meals at a go. GRP472P comes with removable plates. Clean them in the dishwasher and have an easy time utilizing them. Unlike other brands that use stainless steel surfaces, this model improved its nonstick coating. It has a premium quality ceramic layer that increases its aesthetic value and makes the plates five times durable than ordinary grill plates. The ceramic is fade and stain resistant to keep your grill looking sleek. If you love ceramic kitchenware, this indoor grill is for you. With the fat removing slope design, expect to eat meals that contain less fat for a healthy heart. As you grill meat, for example, the grease drains on its own, so it does not stagnate in the meat. Foreman’s GRP472P top and bottom plates are removable featuring plastic grips that protect your hands from burns. This product also has a drip tray that collects fat and grease making your work easier. Cuisinart comes in a silver color with sturdy construction. 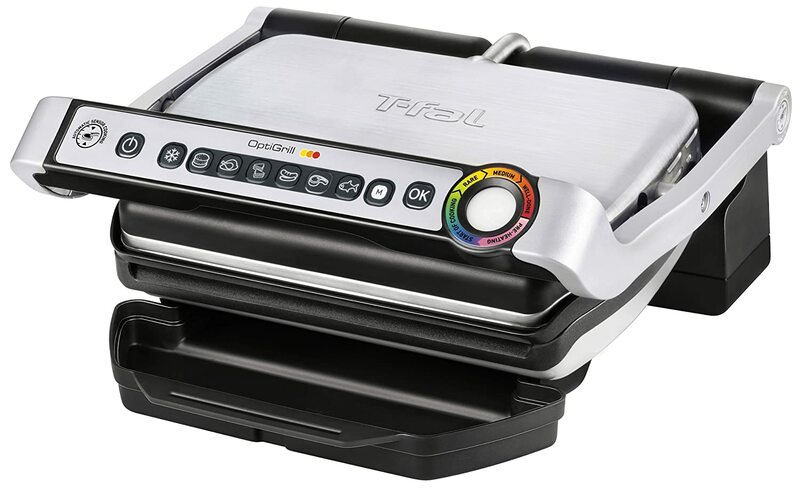 The 5-in-1 term refers to the cooking methods it lets you do, which are contact grilling, Panini press, full grill, full griddle, and half griddle/half grill. If you are an experienced cook, not necessarily a chef, this product suits you perfectly. If you are a beginner cook, then it will expose you to new cooking methods to help you improve your skills and make meals that are even more delicious. On design, Cuisinart has a stainless steel housing that is brushed, a sturdy handle, and a floating cover to let you change food thickness to fit in the grill. It also uses nonstick plates that drain fats and grease into the drip tray. The product has four black dials and temperature control that lets you prepare food at a heating level with which you are comfortable. It has indicator lights to help you through the cooking process. The package comes with recipes to try out and a scraping device to prevent damaging your grill. T-fal is another grill brand that provides four food servings. It has nine programs to enable you to cook a variety of foods including vegetables, meat, and seafood. Get to prepare mouthwatering snacks and main dishes. It has six automatic programs that let you cook different foods burgers, poultry, sandwiches, red meat, fish, and sausages. The program you choose determines the temperature setting. T-fal indicators send you four signals preheating, rare, medium, and well done. The grill has two cooking modes manual and frozen that increase its versatility. Frozen mode comes in handy for refrigerated foods. You do not waste time defrosting thus quickening food preparation. Use the thickness measurement to change temperature settings. The drip tray and plates are removable for easy cleaning while the silver and black color comb suit any décor. This product is durable thanks to the aluminum frame. Remember, the size of meat adjusts the grilling cycle. However, there is another T-fal model that prepares 8servings of food. You cannot afford to purchase indoor grills blindly. You need to have an idea about what you are looking for. That is why we have covered examples of best grills. When shopping, keep in mind the following factors. A grill that has a big surface provides more food servings. The size of the grill you choose depends on the number of people for which you are cooking. If you have a family, go for a grill that can accommodate eight servings of food. If you are single, a small grill of four servings is enough for you. Are you an experienced cook or a beginner? An expert needs a more sophisticated product than a beginner does. More experience means you cook different types of food using different methods. A beginner will find the T-fal brand too advanced, but an experienced cook will love it. 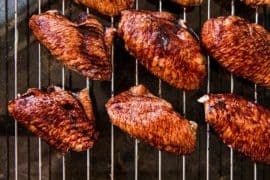 What kinds of food does a grill prepare? The more the kinds, the better. This way, you do not have to buy different grills for different types of food. 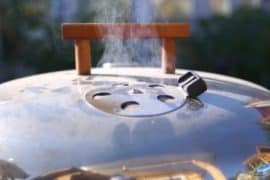 A standard grill should at least cook red meat, sandwiches, burgers, and vegetables. An advanced one should prepare more. An excellent grill has adjustable temperature controls that allow you to cook at your preferred pace and heating. If you get on that automates temperatures depending on the food you are coking, buy it. Flexible temperatures ensure that you have well-cooked meals. A brand that can grill, griddle and Panini press is worth buying. It lets you experiment with a variety of cooking methods. This way, you do not have to eat food prepared the same way every time you use the grill. This improves your skills in the kitchen if you are a beginner. A perfect grill takes minimal time to preheat. It prevents time wastage. Imagine you are hungry and the grill is taking forever to heat up. The frustration and hunger will overwhelm you. Remember to check durability, construction, and material factors. Buy something that lasts, has a sturdy construction and is made from safe, long-lasting materials. As you plan to grill indoors, it is helpful to go for the best grill with removable plates. It makes cleaning a lot easier. You already have examples of products worth considering. All of them are worthwhile purchases. As you research about other brands, keep in mind the factors in the buying guide section to ensure you buy a grill that meets your needs.